The Tennessee Titans have themselves a new slot receiver after they reportedly signed ex-Tampa Bay WR Adam Humphries to a four-year deal. Humphries is coming off a breakout 2018 campaign and figures to slide in as Tennessee’s slot receiver with Corey Davis and Taywan Taylor manning the outside. Somewhat lightly used over his first three seasons in the league, Humphries racked up 76 catches on 103 targets last season. While his 816 yards and five touchdowns don’t necessary leap off the screen, Humphries was productive enough to finish 24th among wideouts in fantasy scoring. He also moved the chains with 48 catches for a first down, 19th at his position. In Tennessee, Humphries steps in and gives the Titans an immediate upgrade at slot wide receiver. The Titans used Rishard Matthews in the slot early in 2018, but then pivoted to Tajae Sharpe as the primary slot after Matthews left the team. Sharpe struggled for much of the year, grading out 131st among wideouts and catching just 56.6% of his targets, with quarterbacks posting a lowly 62.5 rating when targeting him. By comparison, Humphries graded out 41st, caught 73.8% of his targets, and had a 108.7 QB rating from his signal-callers. Humphries saw a 17% target share last season with the Bucs, which was the second-highest on the team. Tennessee spread their targets around for much of the season, with the exception of Davis, who had one of the highest shares in the league at 26%. 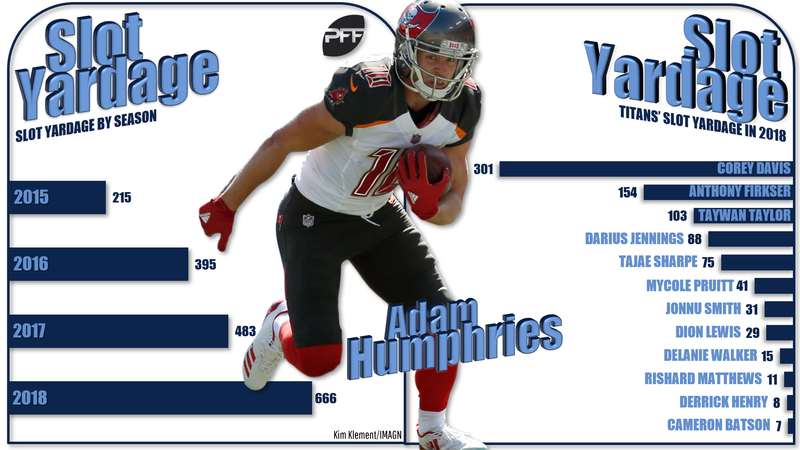 While it’s reasonable to expect a similar share for Humphries in 2019, there’s a major difference between the Tampa Bay offense and the Tennessee offense. Last season, Tampa attempted the fourth-most passes in the league at 625. The Titans ranked 31st with just 436 pass attempts. And this wasn’t an anomaly. Tennessee’s pass attempts have been trending down in each of Marcus Mariota’s four years in the NFL. Last season may be an extreme, but there’s no denying the fact that the Titans aren’t a pass-heavy offense. Even an average of the last three seasons would only get you to a projection of 479 passing attempts. That means roughly 81 targets for Humphries if his share remains relatively the same as last season. His sure hands means we can expect a 70% catch rate, which translates to 56.7 catches. His career clip of 10.6 yards per catch projects out to 601 yards. And given his career touchdown productivity, a reasonable projection with those statistical outputs is about 2.3 touchdowns. Put that all together and you have just 130.5 PPR points, which is over 50 fewer fantasy points than he scored in 2018. That total would have ranked him roughly 56th among wide receivers in fantasy scoring, which would make him barely usable in most fantasy formats. Translation: Humphries’ fantasy value takes a major hit in Tennessee. Of course, the other story from this move is the impact on the Bucs wide receiver corps. With DeSean Jackson also out of the mix, Tampa is now left with a trio of Mike Evans, Chris Godwin, and Justin Watson. There’s no change for Evans in terms of fantasy outlook, and Watson is far from inked into the No. 3 spot. So the obvious player to highlight here is Godwin. Godwin spent much of 2018 as the Bucs’ No. 4 receiver, which led to inconsistent fantasy production. Despite his role, he actually saw a slightly larger target share than Jackson when both were healthy at just over 15%. But Godwin took fantasy owners on a roller coaster ride that began with three scores over the first three weeks of the season and then dipped to just two touchdowns from Weeks 4-16, only to end with 114 yards and two scores in Week 17. With Jackson and Humphries out of the way, Godwin is all but guaranteed to see an uptick in targets. The potential of a 20% share is well within the realm of possibility. While last year’s coaching regime is no longer in place, new head coach Bruce Arians steps in with what will likely be a continuation of the Bucs’ pass-heavy tendencies. In five years at the helm in Arizona, Arians offenses average 589.6 passing attempts per season. Based on that average, an increase to a 20% target share for Godwin would project out to 118 targets. Godwin is hovering right around a 62% career catch rate, which means an expectation of roughly 73 catches. His healthy 14.3 yards per catch from last season would put him up over 1,000 yards, but it’s like that number dips a bit with Godwin likely to see time in the slot. But even at 13 yards per reception, Godwin would still be in the range of 950 yards. With that sort of projection, we could conservatively project 5.5 touchdowns for Godwin, which is a total of 201.4 PPR points. That isn’t a major jump from the 185.2 points he scored last season, but keep in mind that his touchdown projection would suggest regression is coming. But more importantly, this production would place Godwin squarely in the WR2 conversation as a back-end option just inside the top-25 at the position.